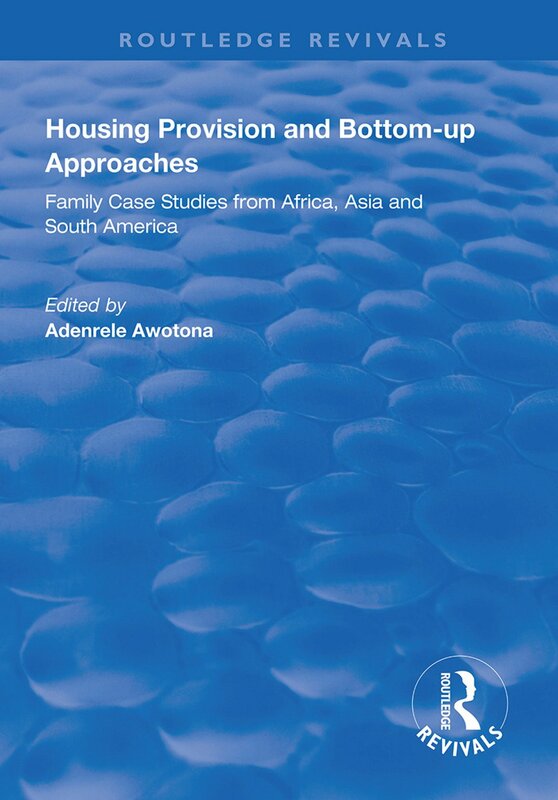 First published in 1999, this book consists of in-depth family case studies from Africa, Asia and South America. The purpose of the book is to give a clear understanding of the physical and non-physical structures in bottom-up housing approaches. Physical structures include design aspects, materials, infrastructure and construction methods and stages. Non-physical structures include finance sources, participation and decision processes. All these elements present a challenging task for academics, research, policy makers and non-governmental organizations when intervening in bottom-up housing approaches. The book consists of four sections. Section I is an overview of conceptual issues and cross-national studies. Section II through IV are composed of case studies and fieldwork experiences from Africa, Asia (including the Middle East) and South America. 1. On the Relationships between Family and Housing , Amos Rapoport. 2. User Modifications in Public Housing Estates : Some Findings From the Nigetian Scene, Ben C. Arimah. 3. Breaking Through the Barrier of Standardisation: The Case of Tenth of Ramadam Core Housing Scheme, Egypt, Hala Kardash. 4. Post-Occupy Evaluation of Five-Storey Wlak-Up Dwellings: The Case of Four Mass Housing Estates in Algiers, Magda Behoul. 5. The Attitude of Libyan Families to their Traditional and Contemporary Houses, Abubaker M. Shawesh , Adenrele Awotona. 6. Housing and Difference in Cape Town , South Africa : Case Studies and Policy Concerns, Andrew Spiegel, Vanessa Watson, Peter Wilkinson. 7. Do Grassroots Publicity and Medica uccess Guarantee Successful Housing? A Case Study of ‘’Bottom-Up’’ Approaches to Housing and Urban Regeneration in District Sic, Cape Town , South Africa , Ola Uduku. 8. Housing Adaptable to Changing Conditions : A Physical Analysis of the Older Neighbourhoods of Yokne’am Illit, Israel, Iris Aravot. 9. Housing Processes in War-torn Areas: Family Case Studies form Lebanon, Souheil El-Masri. 10. Chinese Vernacular Dwellings : A Popular Approach to Housing Supply, Ying Liu , Adenrele Awotona. 11. Balancing Capacity with Vulnerability: Dwelling on Unstable Land, Caqueta , Lima , Peru.